Pinsir is one of those rare Bug-type Pokemon that's actually useful. #27 might be a little high, but I've always had a fondness for the Pinch Pinch. I think it's because its pincers look sort of like pretzels to me. And pretzels are delicious. In fact, the rest of the body looks like a piece of chocolate, so in essence, Pinsir is a Nestle Flipz. In addition to being tasty, Pinsir is not a terrible battler, either. With the sixth highest base Attack of any Generation I Pokemon, Pinserest also has great Defense and pretty good Speed. Of course, the HP and Special leave something to be desired, but hey, you can't win 'em all. Unlike most of the other Bugs in the game, Pinsir is 100% Bug-type. While that of course is still the worst type in the game, being pure Bug means Pinsir is only harmed 2x by Flying, Fire and Rock. You could do a lot worse than dat. 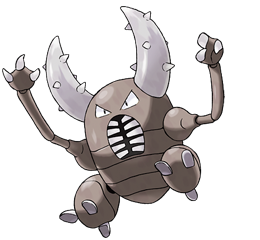 Pinsir's signature move is Guillotine, which presumably beheads your fellow Pokemon when it connects. A little gory on GameFreak's part, but I digress. Guillotine only connects 30% of the time, so I'm not sure it's worth putting on your Pinsy. I also don't know if there are four other moves that are better, so why not have the "instant kill" as a low-accuracy last resort. For sure you'll want to have Swords Dance and Slash, so your Attack can just be ABSURDLY HIGH. Pinsir learns a bunch of Fighting-type moves, as well, and Submission is the best of the bunch. If you're going the non-Guillotine route, a defensive move like Rest or Double Team is the way to go. And hopefully you get to eat some pretzels while you're taking your opponent down.